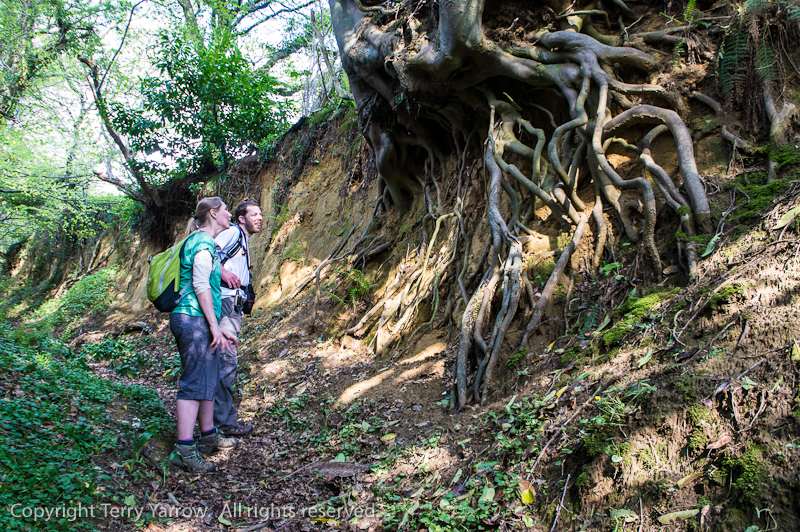 Holloways – walking Dorset’s labyrinthine paths! There are thousands of paths criss crossing Dorset’s wonderful countryside but none as fascinating as these labyrinthine paths like the one in the picture above which goes by the interesting name of Hell Lane! 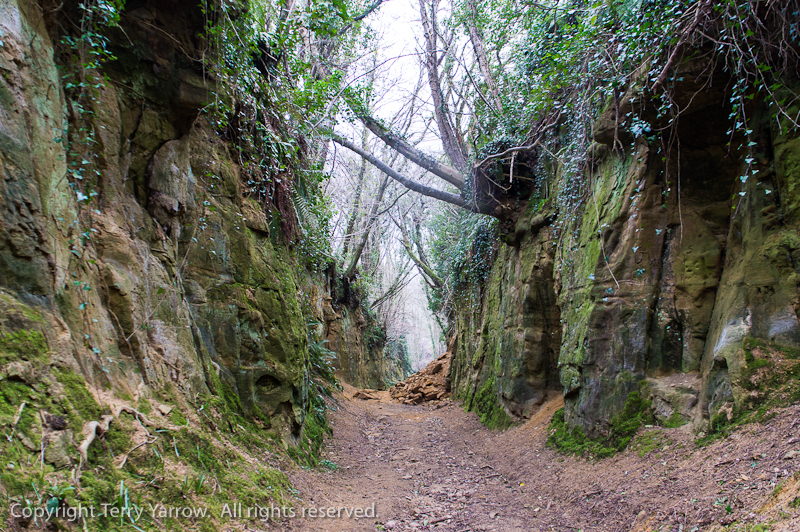 These are known as Holloways, although they do have other names such as shutes, bostels or grundles depending on the area they are in, and they are only seen in the southern counties of England where the bedrock is soft – West Dorset is predominantly sandstone. So what are Holloways? Well the name Holloway comes from the anglo-saxon word which literally means ‘sunken road’, and they date from at least 300 years ago, many going back as far as the iron age. They started life as either drove trails used to move cattle and other animals from farms to markets, routes from inland to the sea ports, pilgrimage routes, or simply boundary ditches. Centuries of use by cattle, carts and people gradually eroded the soft surface creating a ditch which was then deepened and widened by yet more ‘traffic’ and also by water running off the surrounding land as the ditch became at times a river. Eventually, many have become as deep as 20 or 30 feet creating in effect gorges rather than paths. 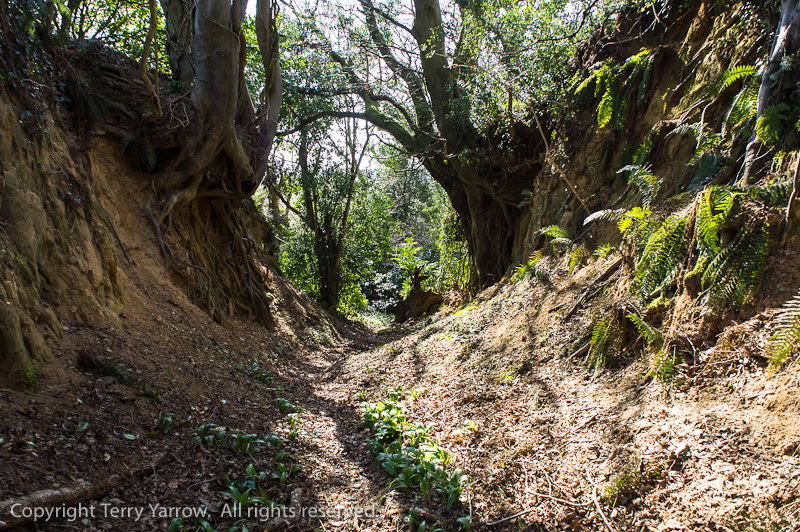 Holloways are a record of the habits of our ancestors with hundreds of years of repeated use and that makes them rich in heritage and mystery……which is why I love walking them. With walls towering on either side and trees growing out of the top with their network of roots holding the walls in place, these paths have a real air of mystery. And lots of wildlife too! Gilbert White, a pioneering naturalist from the 18th century once said that to walk the holloways was to ‘Access a world of deep history, an unexpectedly wild world, buried amid the familiar and close at hand’. He wasn’t wrong! I have a number of regular walks that take in one or more holloways and they are always a delight to walk. On a grey, stormy day you could almost fear to walk them as the gloom and darkness created by the high walls and overhanging branches creates a feeling of shadowy threat. On a bright sunny day with lovely dappled light filtering through the trees, they take on an altogether different feel! They are ever changing, ever different, but always delightful! And as is often the case when I walk, I travel along them wondering about those who have trod that way before – were they early drovers, were they pilgrims heading for one of the Dorset abbeys, were they just ordinary people making their way to the port perhaps to emigrate to other lands! There is always so much to discover as I walk through this lovely county of Dorset. I cannot end this blog entry without thanking those who have sent good wishes on my recent ankle problems. I have now had the results of the X-Ray and it apparently shows that I have osteoarthritis as well as a slightly skewed joint. This is normal in a joint that has had trauma in the past. The words I didn’t want to hear were, ‘The more you walk, the more it will wear‘! However, she did also say that as walking is good for you, and as it is not an exact science, I should keep on walking :)! To use the doctor’s words, ‘The pain will tell you when it is time to stop’! Hopefully that won’t be anytime soon :)! So I am off to test the ankle later this week :)! I am packing my rucksack with tent and everything else and heading off for a four day backpack along the Dorset and Devon Coast Path :)! A blog entry will no doubt follow :)! Previous Of dappled sunlight, amazing views, ridges and valleys, and some lost cows! Lovely reading your post as usual. John says your ankle sounds good if you are off for four days AND carrying tent etc! Looking forward to reading and seeing your next post, tent and all ! If you fancy exploring The Shropshire Hills we would always put you up as now live in Clun! Thanks for your comment, the ankle held up ok on my backpack trip which was really enjoyable :)! Thank you too for your offer of accommodation, it is very kind of you. It is not an area I know so I will have a look. There is a holloway near where I live and there is an active badger set along the steep banks. There are well worn pathways the badgers have made between their holes. I recall from your earlier posts that you have always been fascinated by these pathways. They do have an air of mystery about them and could add a nice touch to some stories I’m sure. I’ve been bogged down with book editing and grading papers from the students in my creative writing class, so I haven’t had time to read anything else. Unfortunately, that puts me about five days behind on your stuff. Sorry about that because they are always so delightful and relaxing. I’ll catch up — if you don’t walk too fast! So glad that the ankle report is not more serious. I believe God will give you strength in it. He says in Psalm 103, you know, that He will renew our youth like the eagle. Keep speaking that Word over your ankle! Thanks Sandra 🙂 Bless you. Very much so Simon. I’ve never been to Lud’s Church but would love to walk there.